A garage door is an essential part of a home. It’s a central part of the view from the curb and thus makes up an important component of curb appeal. It is also provides a functional space in the house. More and more people are using their garages to do more than just store items they’ve forgotten about. They are turning their garages into exercise studios, yoga studios, and fun areas to work and play. That’s why it’s so important to take care of your garage and have it be a safe place. Read on to find out all about garage door safety. Wooden garage doors have been very popular for quite some time. Part of it’s due to their natural beauty and elegance that they lend to any home. Wood tends to be the choice of most homeowners who go for a custom door to fit an odd sized door opening or just for a special piece. Even though it has been replaced by other materials such as aluminum and fiberglass, it’s still a popular material and has been coming back in style in recent years. The problem with wood is that it has many cons to the pros that come with it. For one, wood is an extremely heavy material. There are other materials that tend to be a bit lighter such as the newer lightweight aluminum options. A garage door is extremely heavy, but wood makes it even more so. If you’re the type who wants to be able to manually open your garage doors, then it’s best to practice some special safety measures. First of all, always bend your knees a little bit when lifting so that you avoid putting too much pressure on your lower back. Reach up to pull the door down, bend your knees slightly when you pull down on the door, and brace your core muscles to help support yourself. 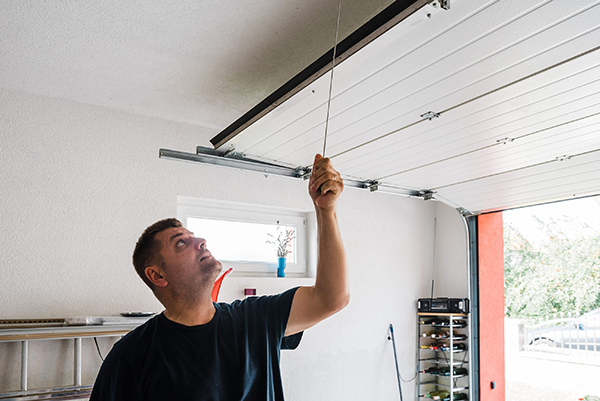 Even though it becomes such an automatic motion, pulling down a heavy garage door is an activity where you focus on what you’re doing so that you avoid hurting yourself. Given the weight of wood, you also want to be sure that you have an experienced repairman do a semi-annual checking of all of the springs and openers. This hardware is what allows the door to easily open and close, even with such a heavy material as wood. Having someone check out the equipment and make sure that it works well and isn’t rusted will save you problems when one of them goes and then the door needs to be repaired. One of the problems that can arise with garage doors and that is by far the most feared by all homeowners is that a person will get hit by the door. It’s of the utmost importance that the sensor that controls automatic garage doors is kept clean and clear of any clutter or debris that could cause the sensor to fail. That may mean that a trained professional has to come out somewhat regularly, maybe annually, to do a look over of the door and make sure that the sensors are in perfect shape. While many companies that produce garage door safety sensors have made progress in terms of reducing deaths and injuries caused by garage doors, there is always a risk that someone will get caught underneath one. Every time that you’re about to open or shut a garage door, it’s highly recommended to get out of the car and look to make sure that there are no small children or pets in the way. A child or an animal may not be able to get out of the way quickly enough. They may not understand the cause and effect such as hearing the garage door and seeing it moved and understanding that it’s about to crush them. For that reason rather than simply glancing over at the door, it’s best to get out of your car and do a quick inspection to make sure that no one is in the way. While there’s certainly a risk that you run by, shutting the garage door yourself and not knowing that somebody is there, there is also the possibility that the garage door could accidentally fall. Depending on the material, this can be quite a serious injury. 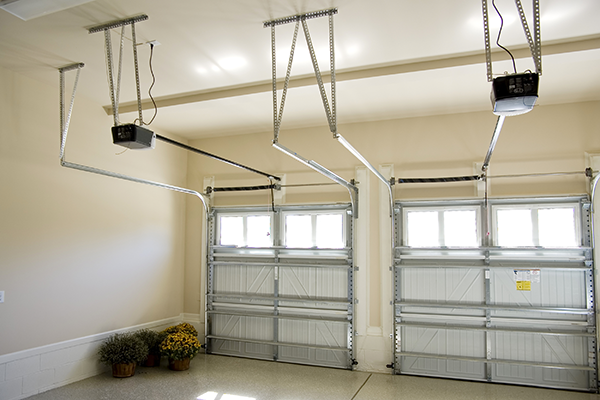 Given the weight of the garage door, a person who gets caught under it could even be killed. That’s why it’s so important to check that all the equipment on your garage door is in good shape. You’ll want to look at the tracks to ensure that they’re clear of debris such as grass or dirt. If you park your car in your garage, you may notice that grass accumulates in the garage because it comes off the car tires. Try to brush off your car tires every once and a while and sweep out the grass that comes off it so that it doesn’t accumulate in the tracks. This will help reduce the chance that the door comes off the track causing an accidental falling of the door. The springs on the garage can also cause the door to possibly fall and hurt someone. An untrained person will probably not know how to check the condition of the springs, so getting an annual check will help you to figure out the condition of the springs and know whether or not you need to replace them soon. Given how useful a garage door is, it’s essential that you keep your garage clean and your family safe by practicing these basic tips. If you have a garage door, you may need some extra tips to keep it working and safe. No matter what material you have, try to check the springs and track on a regular basis and get the help of a professional who can do specific tests. Always look out for small children or animals who can get caught in your door. With a bit of foresight, you can save yourself a ton of money, headaches and keep you and your loved ones out of harm’s way. Stay safe and trust Feldco with your new garage door. Get a free quote now and join the over 350,000 homeowners who have. No matter if you choose a standard steel garage door or a carriage style garage door, we will make sure your door is safe for years to come.